(PMS = Pantone Matching System). Metalic pinting is available at an up-charge of 1 Euro/print. A rought idea for Pantone colours can be found here. 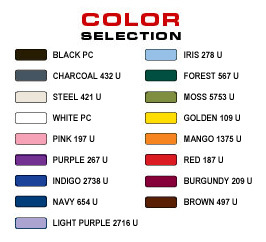 Note: Colours displayed on a screen may vary from the actual colours.